Someone has a photo of the reel/coil in which the Fomapan R100 2x8 30.5m (100ft) is usually contained? I can't find it at home anymore, I don't remember how it's made, I needed it for a project. It’s called a “100 foot 16mm daylight spool”. I just checked and there’s some on eBay. It is a standard 30 meter camera spool. What is the trouble? Roger and Andries, it's 2x8, it should have a round hole compared to those for 16mm camera. Or not? I used it one year ago on the Bolex H8, which certainly doesn't have a square pinion. Or it have a hole with some adapters? I don't remember. There is a 25ft regular8mm spool on eBay for $7.95. I really don’t think there is a difference between 100 foot 16mm and regular8mm daylight spools. I shot regular 8mm reversal and did not have it split; had it returned on a 16mm spool and was able to project it on a 16mm projector. I’m thinking they’re the same spool. More than a year ago, I shot a film with this emulsion and lenght of film, and with a Bolex H8 Rex4. If you try to use a daylight spool with a square hole (like for 16mm cameras) on the Bolex H8, it enter, but it's unstable, vibrates. 1) I place directly the Fomapan R100 2x8 100ft daylight spool (in this case spool had a round hole or an adapter), it fit well, and the film passed on the take-up spool that I showed in the picture. Being Double 8, then I shoted the other half of film. OK.
2) As the Fomapan R100 2x8 100ft daylight spool had the square hole, I wrapped up the film on the spool in the photo (in the dark, of course), and used it for feed spool. And I used another daylight spool with a round hole that I have, equal to the other in photo, for take-up spool. Again, obviously, then I shoted the other side. OK.
Well, I have a specially modified Bolex that shoots a 2.8-1 image on 2x8mm film; it's not split and I show it on a specially modified 2.8-1 16mm projector. I get my unsplit 2x8mm film back from the lab on the original daylight spool; which is a 100 foot 2x8mm daylight spool. It does have square spindle holes in the spool. I don't know why yours has round spindles/holes. I just looked at a Bolex H-8 online and they do have round camera spindles. A friend of mine borrowed my Bolex UltraPan 8 Camera; so I can't look at it. The daylight spool that I shot that 2x8mm Cinechrome does have square holes. Also there are daylight spools; with round spindle holes; on eBay. Roger, I have seen square spindles only on Bolex H8 modified for DS8. But perhaps also other modified H8 have them, who knows, I can't tell you precisely. Remains the mystery as what daylight spools Foma using for its R100 2x8 of 100ft. I seem to see that even the GIC has round spindles. Simon, what other Double 8 cameras have the possibility of 50ft and up (100ft, etc.)? Including those that use external magazines. However I think I have found the Fomapan 100 2x8 spool: it' with square hole, so I must have done the first pass on a round hole spool. The Elmo Trifilmatic 300 DS-8 100ft has square hub-pins and Foma supplies DS-8 100 ft on spools with square holes. The Elmo 8-TL has round pins with a knob in its 100ft magazine. The Elmo 100ft spool has square holes. Elmo 8-TL was very interesting, I didn't know it. The Trifilmatic yes, of course, particular machine. I see in some photos of 8-TL, it has proper round spindles, with a knob to close the spool on site, but I can't see the specific Elmo spools out of the camera. 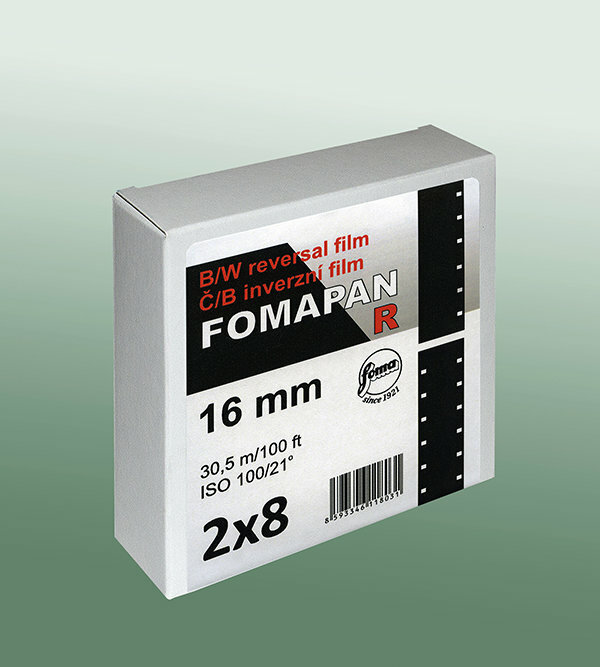 However, I imagine that Fomapan also provides the 2x8 of 100ft lenght to allow cuts and uses also in smaller cameras without 100ft feature, such as the classic daylight spools that all machines have. Well, he needs spools with round holes; so the solution is to buy them on eBay. Lots of em. Thanks for the advice (and for the interesting cameras list! ), the one of the adhesive tape is also very useful. However, I understood why the Fompan does not sell the R100 2x8 100ft format on a round hole spools: not all Double 8 cameras had a round hole for 100ft.